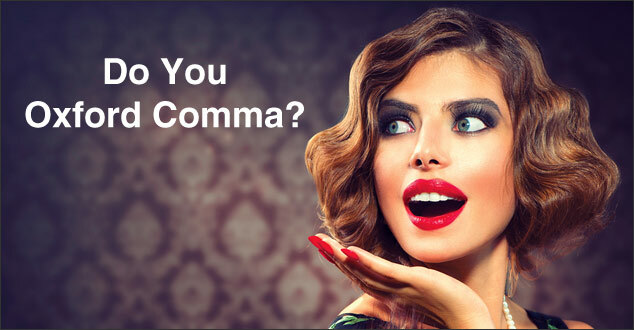 Oxford commas and other grammar silliness that could be losing you business. Are you losing business because of grammar silliness? The English language is bursting with silliness. The more I look into it, the more silliness I find. You may be making grammar mistakes and not even know it. The difference of one letter could change the meaning of a word. Adding a comma could change the meaning of a sentence. I was reminded how important this silliness is when I was discussing preschools with a friend. The other day, my girlfriend was over for a playdate. Our future Nobel Prize winners were playing on the floor and we were deeply discussing preschool options. Preschool has been the topic of many play dates recently. I’ve realized that I’m not the only mom terrified that I’ll make the wrong choice. I’m not really sure why choosing a preschool for your 3-year-old comes with such weight. Maybe because it’s the first educational decision you are making for your child, or maybe it’s because you want the best for your child, or maybe it’s because we moms are all a little crazy. Anyway, my friend was telling me about a particular preschool that we were both really interested in. She had sent them an email and the email she received back was a little shocking. It was shocking because the email was rife with grammar mistakes. I know. It’s a preschool. However, this particular preschool is almost double the cost of the other preschools around the area. We both quickly wrote them off and neither of our Einsteins will be attending that poor grammar expensive preschool. A few grammar mistakes cost that preschool two potential students. I was quick to tell other moms about the mistakes and that number may even be more than two. It may seem crazy that grammar mistakes could be the reason not to choose a certain preschool, but it was. It was an issue of professionalism. Many of the grammar mistakes could have been caught if the writer had only taken the time to proofread and edit. Plus, since there are so many preschools from which to choose, the grammar mistakes made it easy for my friend and me to cross this one off of our list. Let me admit something to you. Grammar is a pain. In fact, for most of my life, I have deeply despised it. There is so much grammar silliness in the English language, how can I keep up? Grammar is a pain, but it could be the difference in making vs. not making a sale. That is the bottom line of this story. So, let me ask you, do you Oxford comma? When I was younger, maybe during high school and into the beginning of my college career, I had drawn the line at the Oxford comma. I refused to do it. I thought it was the most obnoxious grammar silliness. Then, I saw a little visual sketch and everything changed. The impact of this visual caused me to stop my boycott of grammar silliness. Now, I Oxford comma and pay attention to other grammar silliness. It got its nickname “Oxford” comma because it has been traditionally used by the editors, readers, and printers of the Oxford University Press. Grammar silliness occurs when the grammar rule isn’t so obvious. Sometimes one little letter can completely change the meaning of the word. When you are giving a compliment to a friend because you like their new hairstyle, use ‘compliment’. The bottom line is that ‘complement’ adds something to something else. I’m including this grammar silliness because I had to double check it myself for this article. Principal: The highest rank or main participant. When used as an adjective it means the most important of the set. Principle: A Fundamental truth, law, or standard. Grammar Girl writes that “a dangling participle modifies an unintended subject.” Bottom line it’s when you word the sentence in a confusing way. Need a little more explanation? Check out How to Avoid Dangling Participles in Your Blog Articles. Adverse means bad, unfavorable, or not good. Averse means feeling reluctant to something or having distasteful feeling towards something. Insure has to do with insurance by your insurance company. Ensure means to guarantee something. Silly as it may be, poor grammar could lose us business. The power of the blog is undeniable. However, if we are unable to communicate ourselves through the written word, we may not be able to harness any of that power. 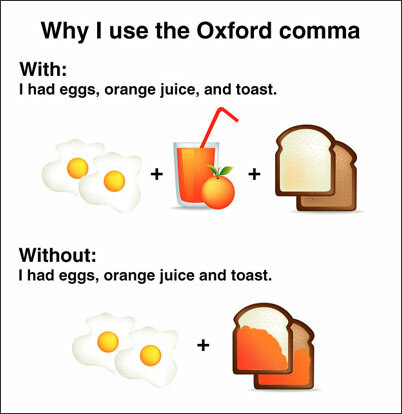 I would love to hear your thoughts about the Oxford comma. Have a wonderful week everyone and happy blogging! 10 Tips On How to Proofread Your Blog Articles – One way to prevent grammar silliness is by proofreading your own work. Proofreading presents its own problems. This article has 10 different tips that will help you proofread your blog articles. Supercharge Your Blog Articles and Woo Readers by Increasing Your Grammar IQ – In this article, you’ll find 3 easy ways to increase your grammar IQ. One of those tips includes, even more, grammar silliness. Grammar Made Easy – How to Use Semicolon vs. Colon – If you are wondering whether or not to use a semicolon or colon, make sure to check out this article. Know that you are not alone. This article was inspired by one of our readers telling us that this was her big grammar issue. I was afraid you were going to tell me the Oxford comma was silliness, and I was all ready to object! 🙂 I love the visual! I’m glad you liked the visual. 🙂 It really put the importance of the Oxford comma into perspective for me. Thanks for commenting and have a wonderful day! I love the Oxford comma! You might want to discuss the colon and the semicolon, which are surely the most frequently misunderstood and perhaps also the most highly distrusted forms of punctuation. Bottom line it’s when you word the sentence in a confusing way. Bottom line: it’s when you word the sentence in a confusing way. The semicolon can be difficult; however, learning to use it properly can add flair and prestige to your writing. I like your style. Adding a colon there would really add to that sentence. I went back and forth about including the colon vs. the semi-colon in this article. In the end I decided not to go into detail about it. Instead I mentioned it at the end with a link to an article that’s sole purpose is unraveling the mysteries of the colon and semi-colon. It’s the last link in the section Don’t Miss These Grammar Mistakes. The article’s headline is Grammar Made Easy – How to Use a Semi-Colon vs.Colon. I was glad to stumble upon your article. I have an MA in Applied Linguistics (which the cool kids call “discourse studies” these days) and I haven’t given much thought to any of this for a while. The Oxford comma is total nonsense. It’s pedantic, it’s superfluous and it’s rude, frankly. In a world where the comma is already overused, one more with a fancy title is akin to grammatical genocide. Don’t be a grammar Nazi. Don’t use the Oxford comma. Thank you for stopping by. I appreciate you sharing your thoughts on this.